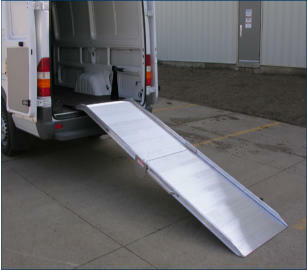 We now carry a line of loading ramps designed for the Sprinter High Roof Vans. Made out of extruded aluminum, this ramp come with aggressive flooring that will work in any climate including snow and rain. These ramps are for High Roof models only. There is a wide selection of widths and lengths. Ranging in width from 24" to 36: wide and lengths from 108" to 126" in standard. We also have a "Spring Assist" ramp 47" wide and 99" long. These ramps are essential for any owner of the Sprinter Cargo van - tradesmen who need to move industrial cleaning machines, electricians, welders, plumbers, motorcycle dealers, garden equipment dealers plus too many to list here. The ramp is removalble from the base-plate with two release pins. This allows for quick removal of the ramp if not required. The ramp stores upright, folded just inside the rear doors. The capacity of the ramp is 750 lbs. Easy to follow instructions and mounting hardware are included for installation. * This ramp is spring assisted for ease of use. * Ramps ship within 5 days of payment.